George Graham Reviews Tracy Nelson's "Victim of the Blues"
Certain music styles don't wear particularly well as a performer gets older, especially in trendy pop music styles. But in more durable genres, maturity often adds authority to an artist's performances. Classical music and jazz performers tend to get better with age. And that's definitely the case with the blues, where it seems life's experience can be an important part of what goes into making the blues the blues. This week, we have a new recording by a veteran performer who made her first album in some 47 years ago, and is sounding probably as good as she ever has: Tracy Nelson, whose new CD is called Victim of the Blues. Ms. Nelson has had a storied career in music. Growing up in Madison, Wisconsin, she heard the blues on AM radio from Memphis as a teenager. While attending the University of Wisconsin, she performed at coffeehouses and frat parties in a group which also included Ben Sidran who would be part of the Steve Miller Band and a jazz musician in his own right. Folk producer Sam Charters signed Ms. Nelson and at age 18, she recorded her first album in 1964 for Prestige Records, in Chicago. Harmonica man Charlie Musslewhite was a sideman on the session, and he took Ms. Nelson to some of the blues clubs around Chicago where she met Muddy Waters and Howlin' Wolf. Not long afterward, Ms. Nelson moved to San Francisco, arriving in the thick of the city's psychedelic scene. She formed the band Mother Earth, who had considerable commercial success and was part of the scene performing at the legendary Fillmore with such people as Jimi Hendrix, and Janis Joplin. Mother Earth released their first of several albums in 1968, and for many Baby Boomers, Ms. Nelson will forever be remembered for Mother Earth. Interestingly, the band went to Nashville to record their second album, and after Mother Earth, Ms. Nelson settled in the Nashville area, where she has been recording a steady, if somewhat infrequent stream of albums in rock, blues and country since then, including a duet with the unrelated Willie Nelson. In fact, her last release in 2007 was an all-country CD called You'll Never Be a Stranger at My Door. The inspiration for this recording came when Ms. Nelson was driving cross country to see an ancestral farm in North Dakota and heard some early blues recordings on the radio, which got her thinking about some of the artists and songs that inspired her in the first place as a youth. So the result is the new CD Victim of the Blues, which features mostly decades-old songs by people like Muddy Waters, Howlin Wolf, Percy Mayfield, Jimmy Reed, Lightnin' Hopkins, Joe Tex and others. She was joined by some tasteful musicians, including guitarist Mike Henderson, keyboard man Jim Pugh, and, on mostly acoustic bass, Byron House, who is known for his work in bluegrass. The drummer is John Gardner, and there are various guest vocalists, including Marcia Ball, Angela Strehli, and another guy who has spent time in the bluegrass world, John Cowan of New Grass Revival. But this is anything but bluegrass album, and there's very little of the country influence which has sometimes come into Ms. Nelson's music over the years. Her voice is better than ever, with all that trademark power and control. This CD project almost was lost when a fire destroyed the 100-year-old farmhouse where she and her long-time partner Mike Dysinger lived in June of 2010. When the volunteer fire company arrived, they said they would be able only to save one room of the house, and she picked the studio where the recordings were mostly finished. So she gives a nod to the fire company in the CD's liner notes. 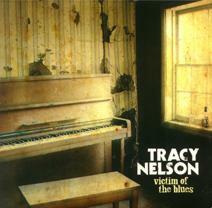 Tracy Nelson's new CD Victim of the Blues, said to be her 26th album in some 47 years of recording, stands as another career highlight. This one takes her back to her roots musically, consisting of almost all old blues songs, many she has known since her youth. She's in great vocal form, and her band is very tasteful and nicely captures the mood and atmosphere of the songs. And they sound as if they are having a fine old time. Our grade for sound quality is an A-minus. A few of Ms. Nelson's vocals sound like an emulation of old analog equipment that was cranked up to where it would distort. But other vocals tracks cound cleaner. The instrumentation is recorded with good clarity and there is decent dynamic range and not much of the oppressive volume compression that is so common in CDs there days. Tracy Nelson said that she had chosen the name of the CD Victim of the Blues before she was affected by the fire that destroyed most of her house with possessions and mementos from her career. But she says the irony is not lost on her. Circumstances notwithstanding, the CD is a highlight in Ms. Nelson's lengthy career, and it shows that she's still in top form.